Eiffel Tower is a ticket redemption arcade machine from Andamiro. As the name would indicate, it is a French themed cabinet and the playfield resembles the Eiffel Tower. Players use a pinball style plunger to shoot the ball into another, which is waiting ball at the top of the playfield curve, which then travels up the tower and lands in one of the ticket baskets of to the left and right of the tower. The tickets and bonus numbers consistently change which adds difficulty to the gameplay, as players cannot just pre-empt the machine. This also allows for more replay value as you cannot always aim for the same goal for the top score, meaning players must hone their skill at the game to win big. This attractive and unique cabinet will draw players in from all across the floor, while the simple game play is easy to understand and will keep players coming back to hone their skills and win. 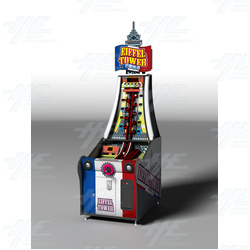 Eiffel Tower is a ticket redemption arcade machine from Andamiro. As the name would indicate, it is a French themed cabinet and the playfield resembles the Eiffel Tower. Players use a pinball style plunger to shoot the ball into another, which is waiting ball at the top of the playfield curve, which then travels up the tower and lands in one of the ticket baskets of to the left and right of the tower. The tickets and bonus numbers consistently change which adds difficulty to the gameplay, as players cannot just pre-empt the machine. This also allows for more replay value as you cannot always aim for the same goal for the top score, meaning players must hone their skill at the game to win big. This attractive and unique cabinet will draw players in from all across the floor, while the simple game play is easy to understand and will keep players coming back to hone their skills and win.